The 2001 Topps Finest set is not one of my favorite designs. In fact, I would say that this particular card looks much more like it was designed by Upper Deck rather than Topps (and that's not meant to be a compliment here). However, for all of the flaws of the front of the card (vertical name plate most egregious), the backside of the card does have at least a few good elements (photo, large team logo, and nice write-up of the featured player). There also exists a parallel of this card (which I don't yet own) numbered out of 499. 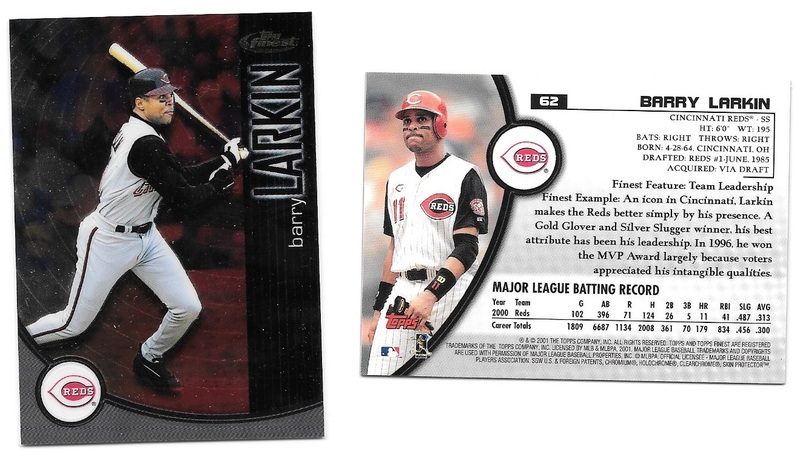 Barry wasn't featured in any of the insert sets so this is a relatively rare turn-of-the-century set with a manageable number of Barry Larkin cards to do track down. Seeing how the parallel is out of 499, even that one shouldn't be too hard to acquire should I put my mind (and wallet) to it. That said, since I don't love this set I won't be any particular rush...who knows, maybe someday someone will send me that card in a random trade envelope!